The Boeing Company initiated the Unmanned Little Bird (ULB) program in the fall of 2003 to create a developmental platform for an optionally manned, vertical takeoff and landing (VTOL) unmanned aerial vehicle (UAV). Initial flight test activity employed a modified MD530FF helicopter, with the first flight taking place on September 8, 2004. Six weeks later the program achieved a fully autonomous multiple waypoint demonstration flight from takeoff through landing. After several hundred hours of simulated autonomous flight with a safety pilot on board, an unmanned flight was performed at the U.S. Army’s Yuma Proving Ground on June 30, 2006. The ULB team’s success in creating a powerful VTOL UAV aircraft for technology innovation and demonstration assisted in the rapid development and understanding of operational concepts and requirements. The platform’s autonomous capabilities continue to be expanded through low-risk testing in support of UAV subsystems development. This article describes a recent company-sponsored flight test effort to integrate and demonstrate a novel and highly precise VTOL UAV navigation system for use in a maritime environment. In it we will describe modifications to the test helicopter, training and qualification of the flight crew and engineering test crew, operational theory, and an evaluation of the precision navigation solution. The result chronicled here portrays a method employing integrated GNSS and inertial navigation capabilities to autonomously guide a VTOL UAV — in this case, a Boeing H-6U helicopter — to a predetermined precision landing anywhere on a ship deck, regardless of deck dimensions. Following its initial accomplishments with the MD530FF aircraft, the ULB program built a second highly upgraded developmental and demonstration test helicopter (H-6U) to support continuing VTOL UAV concepts of operation (CONOPS). This platform more closely resembles the Mission Enhanced Little Bird operated by the U.S. Army’s 160th Special Operations Aviation Regiment, based at Fort Campbell, Kentucky. The H-6U offers a large increase in performance and payload over the original MD530FF technology demonstrator. The design approach and integrated test capability provided by the ULB program supports rapid development and cost avoidance in the growing VTOL UAV market. Beginning August 18, 2008, Federal Aviation Administration (FAA) policy regarding civil unmanned aerial system (UAS) operations with a safety pilot on board forced flight test procedural changes. An FAA memorandum stated that — even if a safety pilot were on board clearing airspace, monitoring all systems, and prepared to immediately take control of the aircraft — if the aircraft trajectory was controlled from outside the cockpit (i.e., a ground control station with an RF data link), the aircraft would be regarded as a UAV. In that event, the FAA insisted on a thorough review of all systems and procedures (a process that would take months) before considering to allow the safety pilot UAV to fly in civil airspace. 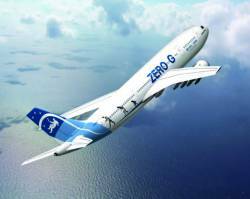 Flight test validation and verification of the trajectory control portions of Boeing’s proprietary COMC2 ground control station software is currently executed in cooperation with New Mexico State University’s Physical Science Laboratory facility near Las Cruces, New Mexico. When trajectory control of the H-6U by the ground control station is not required to accomplish the test objectives, flight testing can be conducted in civil airspace. In this environment, the automated flight control system (AFCS) is programmed to behave as a “full authority” autopilot. Navigation routes are pre-programmed and briefed, and the safety pilot uses a simple button push to allow the H-6U to progress between programmed waypoints. This button push emulates the command that would otherwise be provided by the ground control station operator, and this simple technique allows the ULB team to comply with current FAA policy. The ULB program has realized tremendous value by employing the safety pilot approach. Flight control software can be evaluated in flight, updated, and re-flown in a single day. Lessons learned about aircraft behavior can be modified in flight and fine-tuned for optimal system performance. The safety pilot can allow the AFCS to misbehave long enough to insure that sufficient data is collected to define a system problem, enabling the engineering staff to gain a quicker understanding of malfunctions and thus correct issues faster. Ultimately, the safety pilot is tasked with insuring that the H-6U does not depart to an attitude or situation where the helicopter cannot be recovered without damage or injury. The Boeing Unmanned Little Bird H-6U program recently partnered with French companies Thales and DCNS, which builds warships including a type of frigate on which the VTOL UAV would be designed to land. The objectives of this partnership included development and demonstration of a radio frequency–based navigation system, a ship “green deck window” safe landing period predictor, and a deck-lock aircraft capture device, all intended for VTOL UAV shipboard terminal operations. The terminal area navigation system, known by the French acronym DAA, was designed to minimize ship emissions and be independent of satellite-based navigation solutions such as GPS or GLONASS. The “green deck window” predictor and the deck lock system were designed to minimize human error and the risk of airframe or ship damage during decking operations in a variety of weather and sea state conditions. To support these activities, the Little Bird program needed to create a tool suitable for evaluating the performance of systems such as the Thales DAA radionavigation system. The GNSS/INS described here is designed to meet that need. The ULB team broke the test program into several phases. Initial trials of the navigation system included the use of a six degree-of-freedom motion platform to examine the ability of the navigation system to compensate for ship motion. Concurrently, we evaluated the “green deck window” predictor. The accompanying photos show the mechanical deck lock during static lab testing. The tests progressed to manual, then automatic engagements while landing on a platform that was under way. Cost, safety, and logistical constraints demanded a novel developmental facility to support the intermediate phase of the test program. A tractor-trailer rig was highly modified to emulate the landing deck of a frigate (see accompanying photos). The trailer deck was extended to 16 feet wide with an aft load-bearing helipad measuring 16 x 16 feet. The helipad was equipped with a NATO-standard harpoon grid, which allows the deck lock device to engage and lock to the deck. The forward deck of the trailer was equipped with the RF navigation system, a tactical common data link (TCDL) for VTOL UAV command and control, a differential GPS/inertial measurement unit (IMU) truth data system, and various video cameras. A specially modified command and control vehicle towed the rig at a precisely maintained speed from 5 to 25 miles per hour. This test method allowed the accurate and rapid evaluation of the RF navigation and harpoon deck-lock system to successfully navigate to a landing and secure the H-6U to the helideck. The in-motion test activity took place at the vast runway facility at Spaceport America in New Mexico, which operates within a restricted airspace controlled by White Sands Missile Range. During flight testing at Spaceport America, the GPS/IMU system operated in a real-time kinematic (RTK) mode with a data link to a local reference station; the baseline never exceeded 10,000 feet. Figure 1 demonstrates the level of accuracy in each dimension, comparing the RTK solution versus a post-processed solution. This test vetted the RTK solution for use as a “truth” source to evaluate the performance of the DAA radionavigation landing system. The H-6U cockpit instrument panel was originally equipped for visual flight rules (VFR) operations in a non–visually degraded environment. This cockpit instrumentation was considered adequate for flight visibility conditions that almost always exist in the desert southwest of the United States, where most flight test activity has occurred. However, operations under visibility conditions that can be expected in a maritime environment such as the western Mediterranean demanded a complete redesign of the cockpit instrument panel. Boeing Flight Operations in Mesa, Arizona flies a Eurocopter AS-350B3 helicopter for chase and crash rescue duties. This helicopter is equipped with a glass cockpit display system. The expense of training pilots on different cockpit designs and the complexities of operating various avionics suites made common cockpit avionics architecture a logical decision. The H-6U was also in need of a new radar altimeter for terminal and near-Earth flight operations. We decided to equip our test helicopter with the same avionics suite as the chase helicopter. Output from the radar altimeter could also provide data to the H-6U AFCS where it could be integrated into the flight control laws. Boeing and its avionics supplier agreed to work together to evaluate the performance of the new device, with antennas mounted on the tail boom of the H-6U. Often, radar altimeter antennas are mounted on the belly of a helicopter, an installation that can render the device useless when interference below the helicopter exists. The tail boom antenna placement allows use of the radar altimeter data during slung load operations, as well as while landing to a NATO standard deck-lock grid. The UAV VTOL application requires continuously precise and accurate relative positioning of the helicopter and the ship. The solution implemented on the Little Bird uses GNSS positioning and inertial navigation and is a modernization of a system previously demonstrated in 2005. The conventional way to achieve precise positioning with GNSS is to transmit code and carrier phase corrections from a stationary base station at a known coordinate to the rover receiver. The position of the rover receiver is computed with respect to the base station, with typical accuracies of one centimeter (cm) plus one part per million (ppm) of the distance between the base and the rover (baseline), when a fixed-integer carrier phase solution is possible. In order to achieve fixed-integer accuracies, a minimum of five common satellites must be tracked by both the base and rover. Furthermore, a continuous and robust radio link must be maintained at all times. The failure of either of these criteria, whether due to environmental masking of satellite signals or an intermittent radio link, will result in the inability to achieve the highly accurate differential solution. When landing a helicopter onto a ship, a number of difficulties with the conventional approach to precise GNSS positioning arise. Due to the mobility of the ship and its ability to operate in remote locations, establishing a stationary base station becomes highly impractical if not impossible. Even if it were possible, the varying dynamics of the ship and helicopter can result in highly variable constellations with respect to the base station. Moreover, substantial changes in satellite constellation can weaken the geometric quality of the available observations to the point of losing the GNSS solution altogether. RTK algorithms solve for the position offset vector from the base to the rover receiver. The base receiver does not have to be stationary, and it does not need a highly accurate known coordinate if the only quantity of interest is the relative displacement of the rover with respect to the base. An algorithm used with two GNSS receivers that do not move with respect to each other — a fixed-baseline RTK implementation — can solve for the heading and pitch of the fixed baseline. This algorithm can also be used with two receivers that are moving with respect to each other — a moving baseline implementation. In this case, the base receiver obtains a single-point (autonomous) GNSS position solution and transmits code and carrier phase corrections to the rover based on that position. The rover then uses those corrections to compute the vector from the base to itself, resulting in an RTK-quality solution between the two receivers, even though the absolute position solutions for the two receivers are only of single-point quality. For very precise relative positioning between two systems, a few limitations apply to the accuracy an INS can provide during GNSS blockages or communication failures. The INS relative accuracy is with respect to itself, and both the ship and helicopter GNSS/INS solution will start to drift without GNSS aiding. Their drifts will depend on their respective residual inertial errors, which are not dependent on each other and could be drifting in opposite directions, maximizing the relative ship-to-helicopter solution disparity. The quality of the IMU incorporated into the INS will dictate how quickly the free inertial solution will drift. For a tactical-grade IMU used in a synchronized position/attitude navigation system, the position will drift 10–15 centimeters over 10 seconds in the absence of any external aiding. A navigation-grade IMU would reduce this drift to 5–8 centimeters over the same time interval. The difficulty this poses in the inertial moving baseline case is that the ship and helicopter INS may not smooth out the GNSS variations in the same way. Just as the drift of both INS systems are not related to each other, the smoothing done by both INSes is also not directly tied to the other. The rover GNSS/INS needs an absolute coordinate to update the INS. The coordinate used to update the rover INS is computed by adding the estimated relative RTK vector to the base receiver’s single-point position. Both the ship and helicopter systems are using coordinate updates that have single-point absolute accuracy, and the rover’s update coordinate error follows the base’s coordinate error. Because the rover and base single-point GNSS solution errors could vary significantly due to different constellation views or multipath, this approach minimizes the difference in errors in the coordinate updates used by the base and rover. To further strengthen the relative accuracy of the INS solutions, delta phase updates are continually applied as well. The delta phase update computes a precise position displacement from carrier phase measurements differenced between satellites and over time. This position displacement update is accurate to the several millimeter level (with cycle slip detection in place) and is available whenever two or more satellites are available. The delta phase updates will constrain the drift of the INS solutions if a partial GNSS outage (fewer than four satellites) occurs and also help to further smooth out discontinuities from GNSS position jumps, usually the result of changes in the satellite constellation. The differential corrections are sent from the base to the rover at 10 hertz. (The rate limit on this is imposed by the data link capacity not the GNSS receiver.) The INS is updated at 1 hertz. While the relative RTK solution is available — i.e., data link is working properly and an RTK solution is possible — a position correction is applied to make the output GNSS/INS position match the RTK position exactly. The update coordinate approach described previously seeks to minimize the size of the position correction. In the event that the RTK solution is no longer available, this post-update correction is only applied for 10 seconds. After approximately 10 seconds, the error from the inertial drift becomes larger than the GNSS to GNSS/INS offset, and applying the position correction no longer has a benefit. The relative attitude measurement between the ship and helicopter does not benefit from the moving baseline RTK implementation, computed by differencing the ship and helicopter GNSS/INS attitude solutions. The variance of the relative attitude solution is effectively the combined variance of the ship and helicopter attitude solutions. In our application in which a helicopter lands aboard a moving ship, the quality of the attitude solution on the ship’s system plays the most significant role in determining the overall relative accuracy. The ship’s GNSS/INS system is mounted in a convenient location away from the landing pad, but the landing pad is the true point of interest. Similarly, the landing gear is the point of interest on the helicopter, not the location of the inertial measurement unit (IMU). 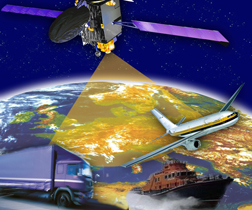 Both GNSS/INS systems must project their solutions from the IMU to the point of interest. To implement this coordinate projection, the offset vector from the IMU must be measured in the IMU frame, and the rotation matrix between the IMU reference frame and the GNSS’s Earth-centered Earth-fixed (ECEF) frame must be known. The accuracy of the solution at the point of interest therefore depends on the quality of the measured offset as well as the quality of the rotation matrix from the IMU frame to the ECEF frame. This rotation matrix is maintained as part of the INS solution. The quality of the rotation matrix is very dependent on the quality of the initial INS alignment (i.e., finding the IMU’s orientation with respect to gravity and north), and the overall convergence of the GNSS/INS solution. The longer the offset vector is to the landing pad, the larger the effect of the rotation matrix errors (i.e., a classic pointing error in survey terminology). Attitude errors in GNSS/INS are best observed with vehicle dynamics. In particular, horizontal accelerations allow the azimuth error to be observed and controlled. Depending on the size and speed of the vessel, the dynamics observed aboard a ship can be very low, leading to degradation in the azimuth solution. The initial alignment poses another challenge as well. A stationary coarse alignment can be performed with tactical grade IMUs, but only when the system is truly stationary. A transfer alignment can be performed with the GNSS course-over-ground azimuth and pitch, but only when the vehicle’s forward direction of travel is aligned to the IMU’s forward axis (or there is a fixed, known offset between them). With a ship or helicopter, these alignment conditions cannot be assured due to crab angles, the angular difference between heading and actual ground path. A ship will often be moving enough to prevent a stationary alignment and its movement without any crab angle cannot be guaranteed. Even if an alignment is achieved, the dynamics will likely be too low for good GNSS/INS convergence. This will degrade the quality of the projected coordinate at the landing pad, which is where the helicopter is aiming. The helicopter system suffers a similar challenge in initial alignment. Helicopters are not an ideal platform to use a transfer alignment from GNSS course-over-ground measurements, due to their maneuverability. To solve the initial alignment problem (on ship and helicopter) and to address the attitude error convergence/observability problem (on the ship), the GNSS/INS was augmented with a second GNSS receiver and antenna, using the fixed baseline implementation of the relative RTK algorithm. The ship’s GNSS/INS has two GNSS antennas associated with it, as does the helicopter’s GNSS/INS. The offset vector from the IMU to both antennas must be measured and input. The pitch and heading of the baseline between the two antennas is used for the initial INS alignment. Because the roll angle cannot be observed with just two antennas, it is assumed to be zero in the initial alignment. After alignment, the GNSS azimuth is used as a heading update to the INS. This solution is critical for the ship system, because the ship will be experiencing low dynamics, making the attitude errors less observable. For the helicopter system, the GNSS azimuth updates are not as vital because the helicopter maneuvers much more and its attitude errors are generally observable via the vehicle dynamics. Flight test operations involving the trailer-borne helipad resulted in more than 100 landings to the moving rig. Although landing on this test helipad was still a challenging feat given the landing deck’s 16×16-foot dimensions and the H-6U landing gear width of slightly more than 8 feet, the only motion environment the helideck presented to the safety pilot was linear translation down the Spaceport America runway. Ships at sea, however, exhibit the following heli-deck motion: pitch; roll; yaw; heave; sway, and surge. Ships also don’t move across the Earth in the same direction as their heading due to local water currents, a factor that must be accommodated in the flight control laws. Moreover, conducting terminal flight operations in the intended operational environment must also deal with the wind turbulence generated by a ship’s superstructure. These factors created a requirement for safety pilot training in a maritime environment. Because the flight tests on the French frigate would require four Boeing engineers and technicians to reside on board for a period of two weeks, the Little Bird program needed to find both a suitable training vessel and qualified trainers to work with the engineers. After an extensive search, the ULB team located a helipad-equipped yacht — Shadow Marine’s Allure Shadow — based in Fort Lauderdale, Florida, that was available for lease by the week. An additional safety requirement for the flight crew was helicopter dunk tank training, which they completed at Louisiana State University’s facility in Lafayette, Louisiana, before the flight test program began. Landing the H-6U helicopter safely on a moving yacht had everything to do with the relative dimensions of both and the adjacent physical structures. The Allure Shadow is equipped with a helipad that measures 34 feet wide by 50 feet long and is surrounded on three sides by horizontal safety nets, which are raised about 5 inches above the helipad surface. At the forward edge of the helipad is an overhang from a pool deck located next to and above the landing zone. Both features are visible in the accompanying photos. The pool deck overhang presents a contact hazard for the helicopter main rotor system while the helipad’s safety net system presents a contact hazard for the helicopter’s tail structure. An H-6U helicopter has the following dimensions: main rotor diameter, 27.5 feet; tail rotor diameter, 4.75 feet; total helicopter length, rotor tip to rotor tip, 32.06 feet. The stinger, the lowest part of the H-6U’s vertical stabilizer, is approximately 2.5 feet above the landing surface. The Squadron advised a minimum of 3 feet lateral clearance from the stinger to the edge of the helipad where the safety net frames protruded upwards, and a minimum of 10 feet lateral clearance between the main rotor blades and the closest ship structure. A careful survey of the helipad yielded a zone of approximately 5 feet fore and aft in which the safety pilot could allow the H-6U to land and insure safe structural clearance. Simple but highly effective markers were installed to create a visual cue environment that could enhance the flight crew’s judgment regarding a safe landing zone. The proximity of the helicopter rotors to the yacht structure, while fairly tight compared to dimensions generally found on DoD vessels, is common in the super yacht world. Risk mitigation dictated that Boeing provide H-6U trained fire/crash rescue personnel and firefighting equipment, independent of the Allure Shadow crew. The Squadron conducted a review of all yacht safety equipment and emergency procedures, provided maritime environment training to Boeing fire/crash rescue personnel, and trained the flight test engineering staff in shipboard flight operations procedures. Knowledge of the ship motion while under way is crucial to insuring that the limitations of the test helicopter are respected during landing and takeoff operations. A system developed for the U.S. Navy by Hoffman Engineering Associates — the “Landing Period Designator” or LPD — was installed and operated by the developer during the flight test program. This system provided trend information, absolute deck motion data, and an indication of deck conditions (color-coded green, yellow, or red; see Figure 3). Use of the LPD ensured that terminal operations were conducted within the limitations of the test helicopter. Of particular interest was the ship motion in the sway axis (lateral back and forth motion), which could contribute to a dynamic rollover event if limits were exceeded. The ULB team used survey instruments to measure the lever arms (offset vector from IMU to GNSS antenna) and point-of-interest offset vectors while the ship was docked. During the survey, it was exceptional windy, leading to ship motion and lower accuracy lever-arm determinations than desired. The H-6U was equipped with the primary antenna on the “T” tail and a secondary antenna on the nose. A laser micrometer mounted on the belly center would measure absolute displacement of the belly above the heli-deck on initial touchdown and the final height after the landing gear had settled. Tables 1 and 2 show the measured offset vectors. Because the lever arm quality was suspect during the test, the helicopter executed a specific set of figure-eight maneuvers to allow for lever arm estimation in post-processing. In post-processing, a significant error in the height component appeared in estimation of the primary lever arm for the ship system. Table 3 gives the post-processed ship offset vector sum, which are accurate to approximately 10 centimeters. Data links transmitted differential correction data between the ship and the helicopter and also transmitted the real-time relative ship-to-helicopter solution, output in the log RELINSPVA, back to the “command center” via radio link. The GNSS/INS receivers on board the Allure Shadow logged raw inertial and GNSS data in order to be able to post-process the ship and helicopter conventional RTK trajectories. In post-processing we also used data collected at the National Geodetic Survey’s continually operating reference station (CORS) “LAUD” located near Fort Lauderdale about 25 kilometers from the test area. The accuracy of each post-processed trajectory was about three centimeters. For performance analysis, the real-time ship-to-helicopter relative position vector was compared to the post-processed ship-to-helicopter relative position vector. The true test of the system’s performance, however, came in the real-time testing as demonstrated in several successful autonomous landings. Tests were undertaken on July 4 and 5, 2012, at sea off the coast from Fort Lauderdale, Florida. For most of the morning, the aircraft performed maneuvers behind the boat, following its movement. Although we would have preferred a sea state or 3 or 4 (wave height between 0.5 and 2.5 meters) during the trials, the water surface was essentially flat, sea state 0. The H-6U was also allowed to approach the landing pad and hover over the landing point to provide a sufficient confidence level that the system was functioning as expected. The aircraft then performed a single automated landing before returning to the airport for fuel. Figure 4 shows the trajectories of the boat (green) and the aircraft (red) during these operations. The aircraft autonomously landed on the helipad at GPS time 316350–316772 seconds. The GNSS/INS system on the helicopter reported a real-time relative position to the helipad center of 0.024m North, -0.028m East, and 1.09m Up. The helicopter belly height measured was approximately 64 centimeters; so, the real-time results seem to have about 40 centimeters of vertical error, which matches the vertical error of the lever arm. Up, which agrees much better to the known helicopter belly height. Figure 5 shows the real-time relative solution of the helicopter landing gear to the landing pad. Figure 6 shows the difference between the real-time and post-processed relative position solutions as the helicopter was landed. Recall that the real-time solution shows about 35 centimeters of height error due to the lever arm used in real-time. The nature of the test program did not allow for extensive tuning of the automated flight control system to respond in an optimal fashion to the navigation data input. Nevertheless, the results from the initial test program were impressive. Table 4 presents the difference between the H-6U position at 10 feet above the helipad and after landings to the helipad during one sortie. The radar altimeter output compared very favorably with the RTK solution, as shown in Figure 7. Installation of the antenna on the tail boom should offer excellent functionality for slung load operations in which the load interferes with the radio wave returns, or landing to a deck-lock-grid–equipped deck where multipath below the mechanical grid surface will render the output completely unreliable. Incorporation of reliable radar altimeter data into the terminal operations solution enhances the reliability and redundancy of the navigation method. Flight tests performed in 2005 and 2006 provided encouraging results for the initial development of a moving-baseline relative navigation system. Extensive flight test activity at Spaceport America vetted the integrity of the GNSS/INS system as a performance evaluation tool for navigation systems such as the Thales DAA radionavigation system. Flight test activity in 2011 at Spaceport America demonstrated the integrity and accuracy of the further GNSS/INS solution, certifying that system for TSPI (time space position information) applications. More than 100 landings were made to the moving trailer helipad. Our most recent maritime flight tests during the summer of 2012 demonstrated the accuracy of the navigation solution, as well as the integration of the navigation solution with the automated flight control system on the Boeing H-6U Unmanned Little Bird. A total of 16 fully autonomous landings and 13 fully autonomous takeoff/departures comprised this latest effort, with the flight crew closely monitoring the controls and the aircraft position when the aircraft was in close proximity to the deck. In the process, the project test pilot responsible for the French frigate-landing test experienced 84 landings to and takeoffs from the yacht. In all, seven sequential days were required to accomplish the deck qualifications of two Boeing test pilots, integrate and debug all systems and software, and carry out maritime terminal operations until the operation became routine. The on-board safety pilot was able to allow the autonomous systems to misbehave enough so as to rapidly gain a good understanding of system malfunctions and how to correct them. Once again, these efforts demonstrated the value of the Unmanned Little Bird program’s optionally manned system architecture. The authors wish to acknowledge the invaluable contributions of the following individuals without whom the safe and efficient execution of the H-6U maritime operations flight test could not have been accomplished. Joshua Pfleeger, procurement agent, Boeing Test & Evaluation for his tireless and determined efforts to get both The Squadron and the Allure Shadow under contract, on time and under budget. Dan Deutermann and Jim Frean of The Squadron, whose knowledge and professionalism made the difference between success and failure of the test program. Brook O’Neill, super yacht captain, and Garrin Hammond, rescue tender operator, for their invaluable contributions towards the safe and effective execution of the flight test program. Dr. Bernard Ferrier, Engineering Head, Aircraft/Ship Dynamic Interface Program, Hoffman Engineering Corporation for his support with the Landing Period Designator system. Dan Ciernia of CAI TV, who captured all the critical elements of the test program on still and video imagery and created a great story. Mike Bobye and Tom Ford (retired) of NovAtel, Inc., for their willingness to support the development of this unique navigation system capability, and for the ingenuity of their methods. Michael Brown, president of Steve Leiber and Associates, whose knowledge and technical support of NovAtel’s product line is unparalleled. Joe Killian, Killian Yacht and Ship Brokers, who “found a way” to get the Allure Shadow under contract. Dino Cerchie, Unmanned Little Bird Program manager, Rick Lemaster, director of Unmanned Airborne Systems, and Debbie Rub, vice-president and general manager, Missiles and Unmanned Airborne Systems for Boeing Military Aircraft, for their trust in the H-6U flight test team, and their determination to secure IRAD (internal research and development) funding for this extraordinary test program. This article is based on a paper presented at the AUVSI Unmanned Systems 2012 conference.